The decorative register cover shown here is sand cast with a 1//4" thick faceplate. You can use the metal louvered vents in the wall, ceiling or floor since they are made from solid white bronze. The Renaissance decorative register cover has a steel damper attached to the back which will close off airflow when it is not needed. Our metal louvered vents are made in America and are handcrafted for quality. These white bronze decorative register covers will have the appearance of brushed nickel and will create a subtle yet powerful look in your home. The metal louvered vents come with installation screws and pre drilled screw holes unless otherwise noted. When ordering the decorative register cover, make sure you are measuring the duct opening in your wall. Place an order for metal louvered vents all at once to save time and money on shipping. Tip: Our decorative register covers are listed according to the measurement of your ductwork opening. Metal louvered vents measuring 14 x 14 inches will fit into a hole opening that size. These registers will have an additional 2 inches added to the border for installation purposes. Overall sizing can vary between vents since these are sand cast. Important: This decorative register cover is made by hand and is considered a special order item. Special order items are not returnable and cannot be canceled once order has been placed. Our metal louvered vents will take 7 to 9 weeks to ship once payment has been received. 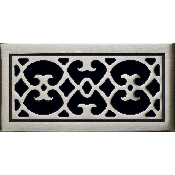 More decorative register covers are offered by Classic Grilles to match any home decor. Find Renaissance metal louvered vents for return air purposes on our website which do not come with a diffuser. Make these Renaissance decorative register covers a statement piece in your home while hiding unsightly ductwork. Order now!